Trooper Kenny Hall was killed when his patrol car was struck as he was issuing a summons on I-91, just north of Route 220 in Enfield. He had stopped a vehicle on I-91 for an infraction and was in his patrol car writing a summons when it was struck by a vehicle that had swerved from the left lane all the way to right the shoulder. The patrol car was pushed into the vehicle he had stopped, trapping Trooper Hall inside for 45 minutes. 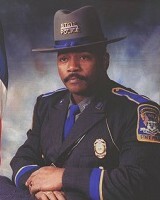 Trooper Hall was transported to Baystate Medical Center where he died from his injuries. The driver who caused the crash tested positive for cocaine and other drugs. He was convicted of manslaughter in September 2011 and sentenced to 11 years in prison. 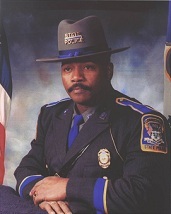 Trooper Hall had served with the Connecticut State Police for 22 years and was a veteran of the United States Marine Corps. He is survived by his wife and four children. You are never forgotten, the simple kindness you showed a young nieve kid by just sitting and talking still plays within me, till we meet again my friend.